Jose Mourinho marked his return to Chelsea with a slight tweak to his image. 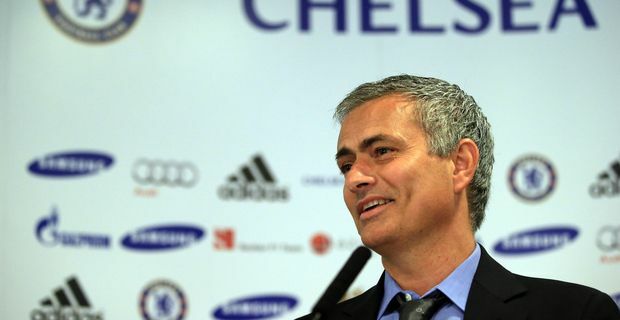 Instead of the brooding, intense "Special One" who brought Premier League titles to Stamford Bridge, he has recast himself as the "Happy One", hoping his mature air of contentment will provide the stability and confidence the club needs to challenge for the title next season. Mourinho was all smiles at his press conference, pointing out that, in contrast to his initial spell at the club, he has nothing to prove. "I'm still very confident, but, at the same time, I'm more stable, more mature," he said. "If I was a proud guy because of what I did before I came here, now I've done more: I've been at Inter, Madrid, won titles." Chelsea fans might worry that this means Mourinho will lack the drive and determination that brought him success earlier in his career, that the return to Chelsea amounts to Mourinho looking for a comfort zone after a turbulent spell in Madrid. The manager was quick to dispel that notion. "I didn't just choose a comfortable position because I'm returning to a house where I was happy and successful and where the fans love me," he said. "No. I'm coming with exactly the opposite perspective. I have more responsibility because of that. The expectations are higher because people know what I can deliver." Mourinho also used the press conference to send all his love to Wayne Rooney, who, not coincidentally, is contemplating a change of club. "He's at a fantastic age for a player: maturity, big experience, still young," Mourinho said. He stopped short of inviting him down to West London, but the implication was there. "It's up to him and what he wants, what makes him happy. A little bit like me. Where will he find more happiness to have ambition and drive him? I like him as a boy. I wish him well and hope he is happy." Not the sort of words you can imagine Sir Alex Ferguson or David Moyes using in Rooney's case. Maybe Wayne is ready for a little Mourinho love?